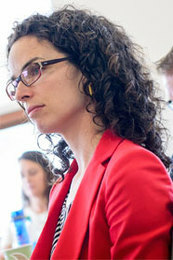 Dr. Susanna Campbell is an Assistant Professor at American University’s School of International Service. She is currently a Post-Doctoral Researcher at the Graduate Institute of International and Development Studies (IHEID) in Geneva. She is the Principal Investigator of a large research project, “Aiding Peace? Donor Behavior in Conflict-Affected Countries,” funded by the Swiss Network for International Studies (SNIS). She just completed a research project funded by the Swiss National Science Foundation entitled, “Bad Behavior? Explaining Performance in International Peacebuilding Organizations,” which produced her book manuscript, Global Governance and Local Peace, now under review with Cambridge University Press. Susanna’s peer-reviewed articles and book chapters examine the micro-dynamics of aid, peacebuilding, and violent conflict. She has extensive experience doing fieldwork in conflict-affected countries, including Burundi, Timor-Leste, Kenya, Uganda, Rwanda, Tanzania, and the Democratic Republic of the Congo (DRC). Susanna’s research has also had an impact on peacebuilding policy within the UN and the US Government, among other organizations. Dr. Campbell's website and CV. Susanna Campbell, Josiah Marineau, Tracy Dexter, Michael Findley, Stephanie Hofmann, and Daniel Walker. Forthcoming. "Peacebuilding in Burundi and the Impact of the UN Peacebuilding Fund Portfolio, 2007–2013." In Cedric de Coning and Eli Stamnes eds. The 2015 Review of the UN’s Peacebuilding Architecture: Impact of the first 10 years? London: Palgrave, forthcoming. Susanna P. Campbell and Peter S. Uvin. 2015. “The Burundi Leadership Training Program” in Michael Lund and Steve McDonald, eds. Susanna P. Campbell. 2008. “(Dis)integration, Incoherence and Complexity in UN Post-conflict Interventions” International Peacekeeping, 15(4):556-569. Susanna P. Campbell and Anja Kaspersen. 2008. “The UN’s Reforms: Confronting Integration Barriers“ International Peacekeeping (2008) 15(4):470-485. Journal of Peacebuilding and Development, 4(2):20-32.